This is part of a series of interviews with members of the Foundation for Young Australians Young Social Pioneers program which supports Australia’s best and brightest emerging social entrepreneurs and innovators, aged 18-29. The program amplifies their social change purpose, builds networks of support and develops their business skills and capabilities to drive successful purpose-driven ventures. Jacob is a young gender-queer activist based in Melbourne, Victoria. Originally from Shepparton, Jacob moved to Melbourne in 2008 to begin his studies at Monash University and graduated with a Bachelor of Arts in 2014. While Jacob works full-time at Monash University, they are also a youth expert on gender equality with the Commonwealth Youth Gender and Equality Network (CYGEN), a TEDx presenter, diversity consultant, and in 2016 was named one of two Queen’s Young Leaders for Australia. For the past four years, Jacob has worked continuously on reducing the rate at which young LGBTQIA+ persons attempt and completed suicide, as well as focusing on building better avenues to accessing primary health care to the LGBTQIA+ community throughout Australia by using smartphone technologies. 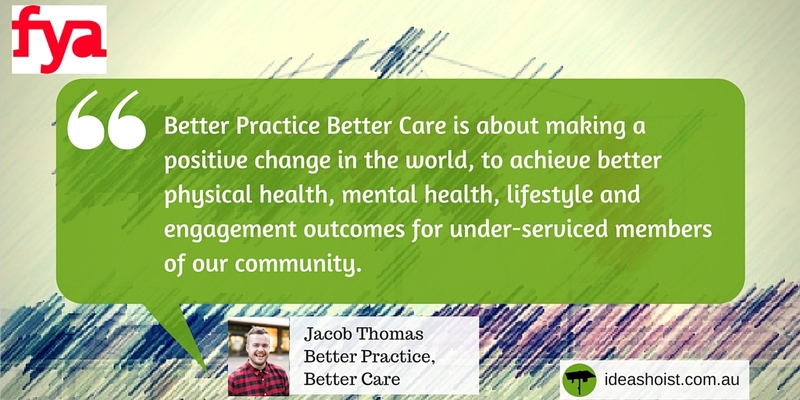 A new app project, known as ‘Better Practice, Better Care’, which aims to locate safe and knowledgeable health practitioners for the LGBTQIA+ community will be launching in 2016, and Jacob is incredibly proud of the work done by their team. Jacob is also currently studying their Masters in Human Rights, is an Ambassador for JOY 94.9’s ‘Schools OUT Loud’ program, a soon-to-be published writer in a new piece called ‘Worldwide Perspective on Gays, Lesbians and Bisexuals: History, Culture and Law’, and is a fabulous fairy-god-parent to an adorable three year-old. At Better Practice, Better Care, we believe that everyone should be able to choose a healthcare provider that’s right for them, and not have to compromise on their happiness and safety in order to do so. We should all be able to walk into an appointment and know what to expect, whether provider or client. We want to ensure that every member of the LGBTQIA+ community, healthcare providers, and our allies, can take charge of their healthcare experience, whether they are providing or receiving care. Better Practice, Better Care (BPBC) as an idea was developed after the completion of a literature review I supervised in 2014. We found that many members of the LGBTQIA+ community – particularly young members – experienced difficulty in finding safe and accessible primary healthcare across Australia. The most concerning and common points out of the data were experiences with homophobia/transphobia, poor levels of empathy and support, and a general lack of understanding how best to support our very diverse community when we access healthcare. This was also fuelled by a personal experience. When I was studying my undergraduate degree, I became quite unwell due to not looking after myself. When I went to a nearby doctor for some advice, I was asked to undergo a test for HIV because, “your people are more likely to get those things”. I was also refused antibiotics for what ended up being a severe chest infection until I completed the blood test. Suffice to say I never went back to that doctor. I always knew there were great GPs and other health practitioners out in Australia doing wonderful work, but it’s difficult to identify them without being a part of the right groups on Facebook and other social platforms. Or services are overwhelmed and the wait lists are long, so we decide not to go altogether. So I decided to submit the idea to FYAs Adappt project. With help from an amazing team of people who believed in the idea, the app started to develop. Our main goal is to find the LGBTQIA+ inclusive GPs, and teach those who want to be inclusive but may be struggling with where to start. Positive healthcare is a collective effort, and our mission is to facilitate this effort as best we can. BPBC is a Social Enterprise. We want the work to be self-sustaining over the long term, so that everyone gets equitable access to understanding, empathetic and knowledgeable health services – particularly from primary care. Our business model is currently under development, as we want to work with GPs and clinics to find a model that works for them, whilst at the same time as developing a product/platform that delivers to community needs. In addition to members of the LBGTQIA+ and wider community, we want to speak to General Practitioners (GPs), clinics, and medical groups to learn more about their needs so we can build a platform that best delivers to all, whilst delivering on our social goals. At the moment we’re in pre-launch phase and are seeking community and GP/practice feedback. 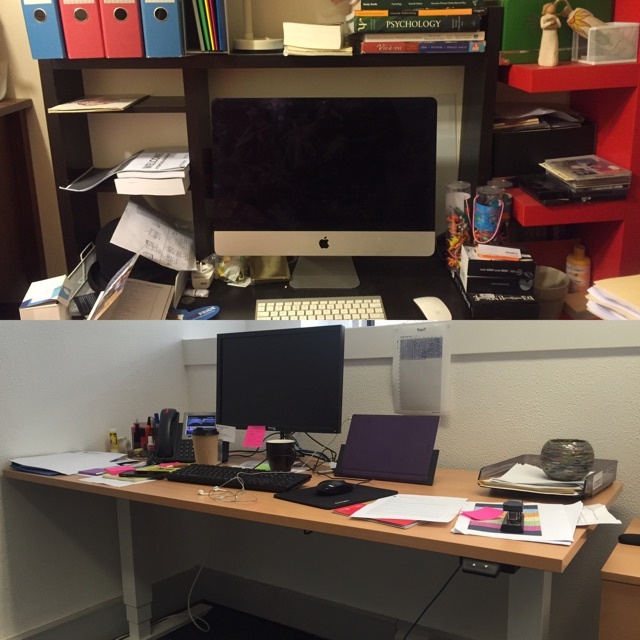 If you want to work with us, or have any ideas we’d love to hear from you! Connect with us and learn a little more about us at betterpracticebettercare.com. We are interested in hearing from members of the LGBTQIA+ community on great experiences they have had from GPs, and where we can help GPs and clinics improve. We’re also interested in hearing from GPs and clinics on their needs, how we at BPBC can best assist these vitally important primary service providers in better meeting the needs of the LGBTQIA+ community. I always aim to understand as much about an issue as possible before tackling it head on. I’m all for taking the time to understand what someone needs, rather than telling them what I think they need. Listening and understanding people is at the forefront of everything I build, which can sometimes be absolutely exhausting. But, when you’ve taken in peoples’ experiences, their stories, what has and hasn’t worked in the past, you are able to gain a real, human-focused solution that you may have missed if you charged too hard forward. I also aim to constantly touch base with people, so that they are held at the center of what I do and that I’m kept accountable. Plus, it means that I can approach ideas with more compassion, which we could all do with a little more of. Like any relationship, sometimes mentors have been great and sometimes it hasn’t worked out. My mentors have usually been wonderful and supportive people. They’ve often provided advice to questions I didn’t even think of asking, and have also forced me to find better ways of articulating business cases around a community need that is often rarely understood. That being said there have been some, shall we say “interesting” mentors in the past, who have told me to give up on what I’m trying to create and that my ideas aren’t good enough, or that I don’t have the experience. Even with these more “interesting” experiences, I’ve tried to take on board their critiques and acknowledge their negativity. Overall, mentors have been beneficial to my business life, even if some were more challenging than others. Mornings often involve a skype session with mates and partners over in the U.S., talking about what we can do together to create positive change for our global community around issues such as gender equality, LGBTQIA+ human rights, and youth involvement in civil society. Then it’s off to the day job with a very large coffee in hand for meetings and program development. Evenings are usually spent studying, researching, meeting with colleagues in the U.K., and/or chilling out with the little one while I introduce her to Adventure Time when mum isn’t around. Weekends often involve more meetings and writing, but with added brunch. Proving to the general public that this is an issue worthy of addressing. We know there are a multitude of issues that need to be addressed across the planet, and that each one deserves its own time. However trying to prove that your idea or this particular issue is important for people to take notice of, especially if they fall into that middle group of not-quite yes/no, can be exceptionally challenging. I’ve needed to take that step back from my hyper-emotional state – particularly where it hits home – and explain the whole topic concisely, while also being courageous. It can feel like you’re compromising on your history, or the history and needs of your communities, but taking that time to invite people into your life can allow you to find the people who believe in you and your ideas, who then want to make it happen no matter what. Better Practice Better Care is about making a positive change in the world, to achieve better physical health, mental health, lifestyle and engagement outcomes for under-serviced members of our community. We’re happy giving that idea away for free! We’d be so happy if someone had already solved this problem long ago – it’s a huge need. Numerous other metro, regional and rural LGBTQIA+ initiatives across Australia. Businesses have a huge role to play in creating long-term social change that isn’t dependent upon Government policies and budgets. We are so pleased to see progressive businesses supporting businesses and enterprises that make social changes, and would like for this spirit to continue and to grow. We want to partner with like-minded businesses to make this change happen. At a more specific level, Better Practice Better Care will only succeed with a successful partnership between BPBC and Australian GPs and Clinics. From our early discussions with these people and businesses – they want to better service their community, but would like help in knowing how. We strongly believe that, together, we can create some great outcomes. Can you name 3 websites other you would recommend to our readers? What about 3 Australians we should follow on Twitter? Absolutely! We would like your thoughts, introductions to change makers within the medical community – particularly GPs and mental health professionals and marketing/PR support when we launch. How do we strike the balance – or the most balanced that we can be – between distinctly different stakeholders, and what do we need to know about these different stakeholder groups to help grow a unified response to the core issue which your business is founded upon?